Artists in the exhibition: 0100101110101101.ORG / Eva & Franco Mattes (I), JODI (B/NL), Michelle Teran (CA), Jens Wunderling & Philipp Bosch (DE) and Anders Bojen & Kristoffer Ørum (DK). 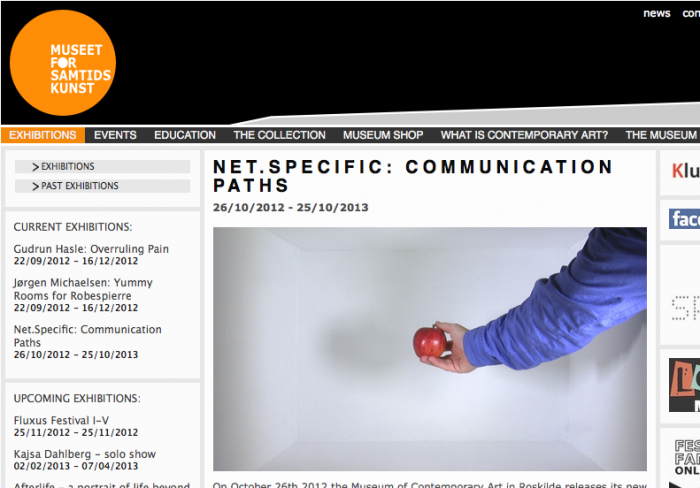 On October 26th 2012 the Museum of Contemporary Art in Roskilde releases its new exhibition website for internet art Net.Specific and its first exhibition Communication Paths. The launch will take the form of a mini-symposium on net-based art with talks and performances related to internet art in general and about the works and artists exhibited in Net.Specific. Internet art is an art form created specifically for the web. It uses all facets of the network in a practice that works with e.g. code aesthetics, narration, anonymity and identity constructions. Artists, who in their artworks are not afraid of borrowing from and reusing all aspects of digital culture as source material. The artworks in Net.Specifics first exhibition Communication Paths are working with communication from a broad perspective and shows artworks on both the internet’s dynamic viral qualities, rumors and e-learning that doubts the theory of gravity. All the artworks in the exhibition are created specifically for Net.Specific and show both pioneering net artists as well as newer additions to the genre. Launch and symposium: October 26th 2012, from kl.15 – 19 at the Museum of Contemporary Art, Stændertorvet 3D, 4000 Roskilde. The event is free and open to all. Comments closed — Trackback URI RSS 2.0 feed for these comments This entry (permalink) was posted on Friday, November 2, 2012, at 8:29 am by admin. Filed in Exhibition.